I lost my blogging mojo a little over the last few weeks. Like everyone, I was stupidly busy in the run up to Christmas. On top of the normal end of year craziness I was helping a friend move house. This meant my time was a bit squeezed and I honestly couldn’t be bothered cooking. I’ve been eating a lot of fruit from the garden and while that’s delicious, it doesn’t make for a very exciting blog post. The mojo is back however, sparked by inspiration from two bloggers. The first was Johanna over at Green Gourmet Giraffe who dropped by last week with some sourdough starter for me. I’ve been making great bread with it, using a slightly modified version of the no-knead recipe. The second was Vaishali over at Holy Cow! She’d written a post early in December for Dhal Tadka that caught my eye, so I bookmarked it for future reference. One led to the other. I had some leftover dough from bread making so I decided to make some flatbread. I just rolled the dough thinly and slapped it onto a frying pan to cook for a couple of minutes on each side. I then held the bread in tongs over the gas flame to puff it up and char it slightly. 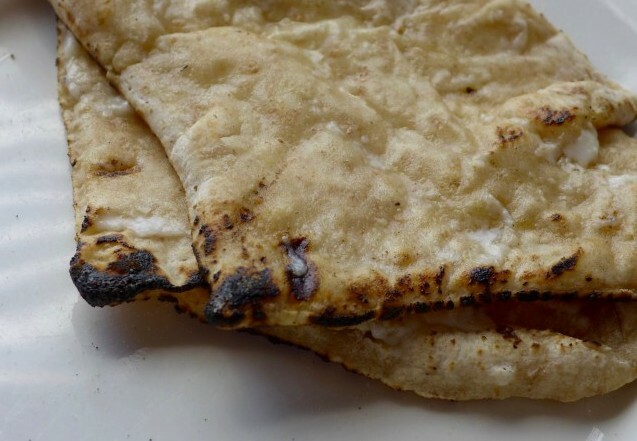 The flatbread obviously needed something to go with it…dhal seemed like an excellent choice. Of course I tinkered, partly out of necessity because I didn’t have the ingredients, partly because I am an inveterate tinkerer with recipes, and partly to add more punch to the dhal. I didn’t have some of the types of dhal Vaishali used so I went with what I had, channa, split urad and mung. I also made more of the tadka spice mix, upping the quantities by half because I love garlic and chilli. I left out the sugar. If you have a pressure cooker the dhal can be ready in 20 minutes. Good, simple, comforting and delicious food. enough water to cover by 2 cm. Wash the dhal, cover with water, add the turmeric and cook until tender. When the seeds start to pop, add the garlic and fry until fragrant and golden, but NOT burnt. Add the chopped tomato and cook down slightly. Stir the oil spice mix into the dhal mix and season with salt and lemon juice to taste. Every time I make dhal I wonder why I don’t make it more often! It is great. If you don’t already read the Holy Cow! blog I can highly recommend it. Ooh I love a good dhal, especially with flatbread! I’ve been the same…lost a bit of mojo for the last 3 months. I’m back to reading my blog reader, which is the first step to getting back and posting again I hope.